Marking its entry into the global computed tomography (CT) market, Fujifilm Medical Systems USA, Inc., introduced the world’s first 85-cm wide-bore CT system on Oct. 21 at the 2018 ASTRO Annual Meeting in San Antonio. The unveiling of the FCT Embrace expands Fujifilm’s diagnostic imaging product portfolio, which is known for exceptional imaging at low dose, and positions the company in the oncology arena. Leveraging more than 79 years of experience in creating high-quality images across industries, Fujifilm is driving greater confidence through improved images with less noise. According to the company, FCT Embrace’s 64- to 128-slice CT capabilities produce some of the clearest, sharpest images in the industry, ensuring the best possible recommendations for treatment. Innovative 4D gating technology accounts for patient movement while breathing, allowing more targeted treatment options. “The fast rotation speed and wider 40-cm detector coverage allow for shorter breath holds for patients and higher image quality with 64- and 128-slice options,” said Alan Glenn, Fujifilm’s vice president of sales, central zone. 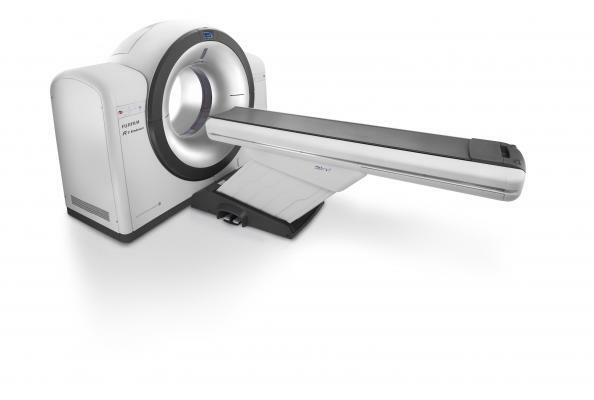 “Its sheer size at 85-cm bore optimally matches the rotational arc of the linear accelerator to offer easier and precise positioning options for simulation while providing an open patient experience,” he continued. The 85-cm bore is one-size-fits-all, comfortably accommodating virtually any patient, from bariatric to pediatric; and procedure, from prone breast board to large biopsy needle placement. Additionally, the aperture of the 85-cm bore is suited to treatment planning software, easing the transition from radiology to oncology. For radiology and radiation oncology professionals who face logistical complexity while making high-stakes care decisions, the FCT Embrace also features a modular platform to seamlessly serve the needs of a wide range of medical specialties, spanning oncology, pediatrics, geriatrics, orthopedics, and emergency care. “The modular platform maximizes synergies of care,” emphasized Glenn. As for system size, simple siting and smaller footprint economize space, leaving more room for medical professionals to operate. The FCT Embrace also offers the industry’s widest table at 49 cm, maximizing comfort for a wide range of patients, and minimizing the risk of falling. Touting “frictionless flexibility,” the FCT Embrace is comprised of just 4 major parts with 100 components, which streamlines hassle-free installation and maintenance. In addition, innovative PowerLink slip-ring technology seamlessly connects all parts of the machine, with no inconvenient brushes and parts to replace. The customer service team offers remote monitoring on all systems, and an 18-month warranty covers all aspects of component design, making maintenance easy and affordable. Fujifilm’s new FCT Embrace delivers flexible scalability. Appl Radiol.